We’ve grown and tried countless carrots in our quest to bring you the best flavour. These are next best thing to growing your own: fresh, sweet and properly carrot-y, with a delightful crunch. Enjoy raw, grated with lemon juice, olive oil and coriander leaves. Or thinly sliced and sweated until tender with a little butter and honey. Whatever else you do, don’t boil them to death! To intensify their natural sweetness, roasting is the way to go, whether you want a simple side, a mixed tray of roots, or a base for carrot soup. Carrots keep for several weeks in a paper bag on a cool veg rack. 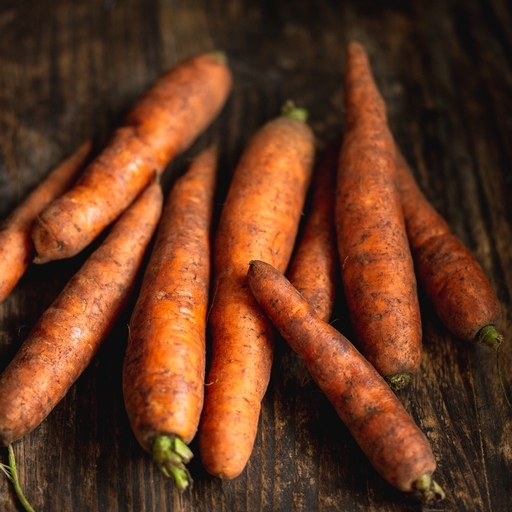 If you have new season bunched carrots with their tops attached, twist off the tops before storing, as they draw moisture away from the carrot. Homegrown carrots are harvested in early summer as new season bunched carrots with their tops on. We can carry on harvesting until November and then store the main varieties to see you through winter and into spring. Later in the spring we may supply carrots from our Italian growers. Nairobi accounts for over half of the UK carrot crop. It’s easy to grow and very robust, but it always comes out bottom in our taste tests. So we prefer Artemis, Trevor, Nerac, Narbonne and Autumn King, which have much better flavour, as well as standing up well to harvesting. Peter Wastenage, a member of our local farming co-op in Devon, grows our gold award-winning bunched carrots. Carrots tend to enjoy lighter soils, so Graham Negus, who farms the sandy soils near Riverford on Sacrewell Farm in Cambridgeshire, also grows some fantastic carrots for us.